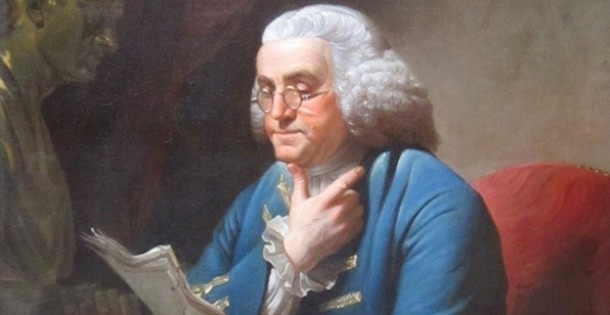 What Ben Franklin Knew About Leadership Development | MC Associates Inc. The Father of Modern Leadership Development? Since his birthday was in January, there was a recent flurry of articles and posts about olde Ben Franklin. One of the articles referred to the character development system that Ben created at the age of 20. In his autobiography, Ben attributed much of his success to regularly focusing on and practicing 13 Virtues. Ben was ahead of his time on many things but I never realized, until reading more about his character building system, that he may also be the father of what we now know as effective leadership development. Here are some of the modern, evidence-based leadership development practices that Ben seemed to have understood intuitively. Effective leadership development is built into work, not bolted on as something extra. We now know that effective leadership development follows a 70-20-10 pattern; 70% of development comes from navigating a challenging work or life experience, 20% comes from other people and 10% from self-study. Ben worked on improving his 13 competencies in his everyday life – trying to do something differently, doing it more often or doing it better. He didn’t go to a Virtue Development Workshop. Building a new leadership skill requires regular reflection. While experience is critical to learning, recent field and laboratory research has shown that so is regular and deliberate reflection on the learning experiences we are navigating and documenting insights (writing them down.) For much of his life, Ben carried a card around in his pocket that contained a table of the 13 Virtues and a place for him to tally his success in using the Virtues. He described how he would look at the cards throughout the day and then review them at night. Ben had reflection down pat.Never Learn Alone. This is the “20” of the 70-20-10 development pattern. Human learning benefits by the involvement of other humans – as role models (Ben choose Jesus and Socrates) or as sources of feedback and support. Ben envisioned creating sort of a Virtue University where people interested in living the virtuous life could come together, discuss the virtues and compare notes on what was working. This entry was posted in Leadership and Executive Development, Strategic Talent Management and tagged Leadership Development by Michael Couch. Bookmark the permalink.